Principles solidified the way I thought about making decisions and is pretty clearly the most important book I read in 2017, if not my entire life. I made copious notes from the book and thought I might as well share it here. Well worth buying a physical copy and keeping it on your shelves in my opinion. I might get around to organizing the notes a little but I’m just putting it up in raw form, hopefully it’s useful to some people. When you change the systems that currently run your life, you’ll start producing the results you desire – and it can feel like it’s all on autopilot. Principles are fundamental truths that serve as the foundations for behaviour that gets you what you want out of life. They can be applied again and again in similar situations to help you achieve your goals. If we classify these situations into types and have good principles for dealing with them, we will make better decisions more quickly and live better lives as a result. Having a good set of principles is like having a good collection of recipes for success. Think for yourself to decide 1) what you want 2) what is true and 3) what you should do to achieve 1 in light of 2, and to do that with humility and open-mindedness so that you consider the best thinking available to you. To make money in the markets, one needs to bean independent thinker who bets against the consensus and is right. To be a successful entrepreneur, the same is true one had to be an independent thinker who correctly bets against the consensus, which means being painfully wrong a fair amount. Make believability-weighted decisions, operate by principles, and systemize your decision making. Time is like a river that carries us forward into encounters with reality that requires us to make decisions. We can’t stop our movement down this river and we can’t avoid those encounters. We can only approach them in the best possible way. If you are ready to give up everything else and study the whole history and background of the market and all principal companies whose stocks are on the board as carefully as a medical student studies anatomy – if you can do all that and in addition have the cool nerves of a gambler, the sixth sense of a clairvoyant and the courage of a lion, you have a ghost of a chance. I just want to be right – I don’t care if the right answer comes from me. 1. Seek the smartest people who disagreed with me so I could try to understand their reasoning. Bridgewater is built as an idea meritocracy – not an autocracy in which I lead and others follow, and not a democracy in which everyone’s vote is equal – but a meritocracy that encourages thoughtful disagreements and explores and weighs people’s opinions in proportion to their merits. My approach was to immerse myself in a business until I got to a point where I felt that the strategies I was handing off were the ones I would use were I running the company myself. Return of a market itself is called beta. Alpha is the return that comes from betting against others. If you work hard and creatively, you can have anything you want but not everything. Maturity is the ability to reject good alternatives in order to pursue even better ones. I didn’t value experience as much as character, creativity, and common sense, which I supposed was related to my uavin started Bridgewater two years out of School myself, and my belief that having an ability to figure things out is more important than having specific knowledge of how to do something. Making a handful of good uncorrelated bets that are balanced and leveraged well is the surest way of having a lot of upside without being exposed to unacceptable downside. Having a process that ensures problems are brought to th surface, and their root causes diagnosed, assures that continual improvements occur. I realized then how essential it is that people in relationships must be crystal clear about their principles for dealing with each other. Those that do best both see a wide range themselves while triangulating well with other brilliant people who see things in different, complementary ways. There are far fewer types of people in the world than there are people and far fewer different types of situations than there are situations, so matching the right types of people to the right types of situations is key. One of the great things about algorithmic decision making is that it focused people on cause-effect relationship and, in that way, helps foster a real idea meritocracy. It is very important to make sure no one person is more powerful than the system. Therefore a governance model is necessary. 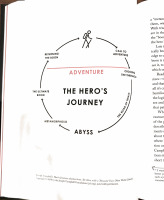 It’s perfectly sensible to not have any desire to go on a hero’s journey. What’s most important is to know one’s own nature and operate consistently with it. To transition well, there are only 2 things you need to do. Put capable ceos in Place and have a capable governance system to replace the CEO’s if they’re not capable. Governance is the system of checks and balances ensuring that an organization will be stronger than whoever happens to be leading it at any one time. I learnt to love my struggles which I suppose it a healthy perspective to have, like leaning to love exercise. The satisfaction of success doesn’t come from achieving your goals, but from struggling well. Since Life brings both ups and downs, struggling well doesn’t make your ups better; it makes your downs less bad. I’m still struggling and I will until I die, because even if I try to avoid the struggles, they will find me. I find it exhilarating being caught up in the feedback loop of rapid learning – just as a surfer loves riding a wave, even though it sometimes leads to crashes. 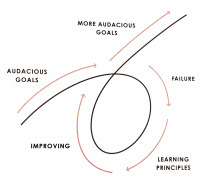 Learning is the product of a continuous real-time feedback loop in which we make decisions, see their outcomes and improve our understanding of reality as a result. Perfection doesn’t exist; it’s a goal that fuels a never ending process of adaptation. The constant drive toward learning and improvement makes getting better innately enjoyable and getting better fast exhilarating. Material rewards don’t supply anywhere near the long term satisfaction that getting better at something does. There is no avoiding pain, especially if you’re going after ambitious goals. Most people have a tough time reflecting when they are in pain and they pay attention to other things when the pain passes, so they miss out on the reflections that provide the lessons. The challenges you face will test and strengthen you. If you’re not failing, you’re not pushing your limits, and if you’re not pushing your limits, you’re not maximising your potential. Though this process of pushing your limits, of sometimes failing and sometimes breaking through – and deriving benefits from both your failures and your successes – is not for everyone, if it is for you, it can be so thrilling that it becomes addictive. The higher your ascend, the more effective you become atvwitkijg with reality to shape outcomes toward your goals. What once seemed impossibly complex becomes simple. Embrace tough love. In my own life, what I want to give to people, most importantly to people I love, is the power to deal with reality to get what they want. In pursuit of my goal to give them strength, I will often deny them what they “want” because that will give them the opportunity to struggle so that they can develop the strength to get what they want on their own. Do not be embarrassed about your problems, recognise that everyone had them. Bringing hem to the surface will help break bad habits and develop good ones, and you will acquire real strengths and justifiable optimism. People should be helped by giving them opportunities and the coaching they need to become strong enough to take advantage of their opportunities. If you can do it well, you can change your psychological reaction to it so that what was painful can become something you crave. While the right design is essential, it is only half the battle. It is equally important to out the right people in each of those positions. Distinguish between you as The Designer if your machine and you as a worker with your machine. If you can recognise the differences between those roles and that it is much more important that you are a good designer/manager of your life than a good worker in it, you will be on the right path. To be successful, The Designer/manager you has to be objective about what the worker you is really like, not believing in him more than he deserves, or putting him in jobs he shouldn’t be in. If you are disappointed because you can’t be the best person to do everything yourself, you are terribly naive. Asking others who are strong in areas where you are weak to help you is a great skill that you should develop no matter what, as it will help you develop guardrails that will prevent you from doing what you shouldn’t be doing. All successful people are good at this. You will need to do all five steps well to be successful zc and you must do them one at a time and in order. Get used to the discomfort that comes with the constant frustration. You will never handle everything perfectly. Mistakes are inevitable and it’s important to recognise and accept this fact of life. The good news is that every mistake you make can teach you something, so there’s no end to learning. Your ability to get what you want will thrill you. Typically, desires are first order consequences. You need to push through and that requires self-discipline to follow your script. It’s important to remember the connections between your tasks and the goals that they are meant to achieve. Establish clear metrics to make certain that you are following your plan. There are many successful, creative people who aren’t good at execution. They success because they forge symbiotic relationships with highly reliable task-doers. When you’ve completed all 5, you start again with a new goal. Goal setting requires you to be good at higher level thinking like visualization and prioritization. Identifying and not tolerating problems requires you to be perceptive and good at synthesising and maintaining high standards. Diagnosis requires you to be logical, able to see multiple possibilities, and willing to have hard conversations with others. Designing requires visualization and practicality. Doing what you set out to do requires self-discipline, good work habits and a results orientation. Having both open-mindedness and good mental maps is most powerful of all. Ego and blind spots are the fatal flaws that keep intelligent, hardworking people from living up to their potential. Radical open-mindedness is motivated by the genuine worry that you might not be seeing your choices optimally. Open mindedness doesn’t mean going along with what you don’t believe in; it means considering the reasoning of others instead of stubbornly and illogically holding on to your on point of view. Be clear whether you are arguing or seeking to understand and think about which is most approriate based on your and others believability. If both parties are peers, it’s appropriate to argue. But if one person is clearly more knowledgeable than the other, it is preferable for the less knowledgeable person to approach the more knowledgeable one as a student, the vice versa as a teacher. Believable people are those who have repeatedly and successfully accomplished the thing in question. Appreciate the art of thoughtful disagreement. Your goal is not to convince the other party that you are right – it is to find out which view is true and decide what to do about it. Spend your time exploring ideas with the most believable people you have access to. Assess your relative believability to determine whether your primary role should be as a student, teacher or a peer. Close minded people say things like “I could be wrong” but it’s often a perfunctory gesture that allows people to hold their own opinion while convincing themselves that they are being open-minded. Make being open-minded a habit. The life that you will live is most simply the result of habits you develop. “Machine thinking” tools will continue to develop and smart decision makers will learn how to integrate them into their thinking. Becoming truly open minded takes time. People aren’t intentionally acting in a way that seemed counterproductive; they were just living out things as they saw them, based on how their brains worked. As off-base as they seem to me, they saw me the same way. Most attributes are a double-edged sword that brings potential benefits and potential harm. The rewards of working together to make the pie bigger are greater than the rewards of self-interest, not only in terms of how much “pie” one gets but also in the psychic rewards wired into our brains that make us happier and healthier. Brain plasticity is what allows your brain to change its “softwiring”. Introverts often prefer communicating in writing (such as email) rather than speaking in group settings and tend to be less open with their critical thoughts. Manage yourself and orchestrate others to get what you want. Consciously develop habits that will make doing the things that are good for you habitual. As a professional decision maker, look for rules and systems that will improve your odds of being right. The biggest threat to good decision making is harmful decisions, and decision making is a 2 step process: first learning, then deciding. It’s never harmful to at Keat hear an opposing point of view. Deciding is the process of choosing which knowledge should be drawn upon. This involves playing different scenarios through time to visualise an outcome consistent with what you want. To do this well, you need to weigh first order consequences against second and third order consequences, and base your decisions not just on near term results but on results over time. Getting an accurate picture of reality ultimately comes down to two things: being able to synthesis accurately and knowing how to navigate levels. There are typically just 5 to 10 important factors to consider when making a decision. Decision making should be evidence-based and logical when groups of people are working together. Think of every decision as a bet with a probability and a reward for being right and a probability and a penalty for being wrong. The ego barrier is our innate desire to be capable and have others recognise us as such. The blind spot barrier is the result of our seeing things through our own subjective lenses. Make your passion and your work the same and do it with people you want to be with. Work is primarily the game that you play to follow your passion and achieve your Mission. It is never acceptable to get upset if the idea meritocracy doesn’t produce the decision that you personally wanted. The worst way to pick people is based on whether their conclusions align with yours. People can have a wonderful relationship and disagree on some things; you don’t have to agree on everything. Everybody has strengths and weaknesses. They key is understanding one’s weaknesses and successfully compensating for them. The greatest gift you can give someone is the power to be successful. Giving people the opportunity to struggle rather than giving them the things they are struggling for will make them stronger. Being able to see yourself from a higher level is essential for personal evolution and achieving your goals. No matter what you do, at a high level you are simply setting goals and building machines to help you achieve them. Build great metrics. If your metrics are good enough, you can gain such an complete and accurate view of what your people are doing and how well they are doing it that you can almost manage via the metrics alone. Eliminate any confusion about expectations and ensure that people view their failures to complete their tasks and achieve their goals as personal failures. The most important person on the team is the one who is given the overall responsibility for accomplishing the Mission. This person must have both the vision to see what should be done and the discipline to make sure it is accomplished. Every problem you find is an opportunity to improve your machine. Don’t focus too much on rare events or the trivial problems – nothing and no one is perfect – but be sure you are not overlooking a clue to a systemic machine problem. Make your work and passion the same thing. Struggle well with others on your common mission to produce the previously unmentioned rewards. Savor both your struggles and your rewards. Evolve quickly and contribute to evolution in significant ways.